Below is an excerpt from the book “Clarendon Vermont 1761 – 1976” Academy Books Rutland, Vermont. “Be it remembered to the glory of the divine grace that it pleased God in the beginning of this year to visit his people in this place to awaken and reclaim some that were slumbering or wandering and to convert some to the knowledge of the truth so that on the eighteenth of February AD. 1822 a church was organized by the Rev. Henry Hunter resident as an evangelist and the Rev. Stephen Martind ale of Tinmouth.“ Thus the first pastor of the Congregational Church prefaced the original record book. The Revs. 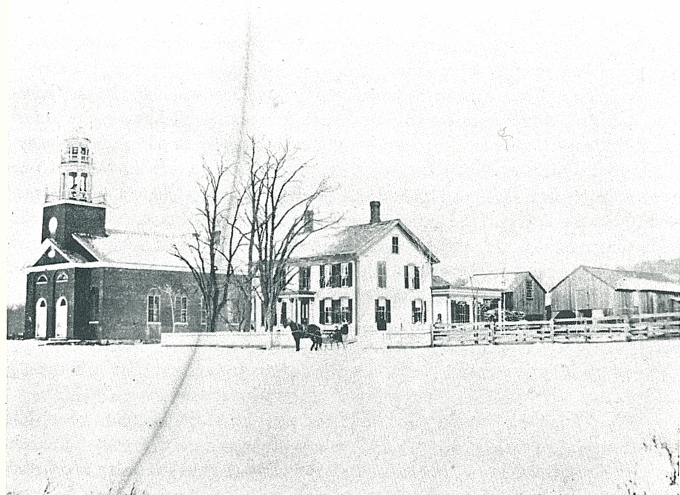 Hunter and Martindale along with ten members of the community got together on February 1822 to start the Congregational Church of Clarendon. For 2 years after the organization and signing of the Constitution, meetings were held in the brick school house north of the land deeded to Second Religious Society or else in the old Baptist building. Each member of the congregation was expected to be a model citizen and attend church regularly. Charges were brought against members for “intemperance and irregularity of conduct.” For punishment, the accused was required to make a public confession and promise to reform although expulsion from the church and its activities was also possible. Remodeling the church began in 1858. The singer’s gallery was closed off, the pulpit redone, and the sounding board was removed. The bell in the church today was placed in the belfry in 1869. The bell weighs over 800 pounds and cost the people more than $300. 1873 brought about the sale of the first parsonage and the building of a new one. While all of the external improvements were being made, in 1876 George Morse became the inspiration for spiritual renewal. 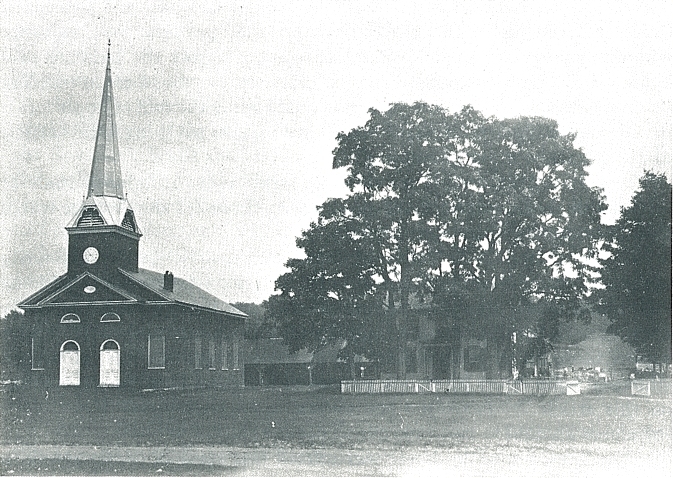 During his time as pastor Morse brought new light to the people of the Old Brick Church. Everyone got involved with the upkeep of the church. A Ladies Aid Society was organized to raise money for costly repairs. A youth group brought in famous clergymen to lecture with the profits used also for repair work. The Steeple was built from this money. The memorial windows in honor of Mr. and Mrs. Hannibal Hodges, Joseph and Sabia Gaskill, Mr. and Mrs. Silas Willis Hodges, Henry Hodges, Deacon Frederick Button, Deacon Nathaniel Crary, Chester and Rhoda Kingsley, Silas and Polly Bowen, John N. Pierce, and George Crossman were also installed at this time. In 1924, there was no resident pastor so after 100 years the Church had to be closed save only for special occasions. Mrs. Gratz Powers thought it a shame that no one used the church anymore, so in 1935 she suggested that it be reopened during the summer. Each year since a Yale student spent ten weeks or more at Clarendon. The student leads Sunday services, organizes programs for young people, and joins community leaders in carrying traditions established long ago. *Spelling of first name is uncertain. The list of the first contributors in the records of the Second Religious Society in Clarendon, Rutland County, Vermont. Date Of the list: January 8, 1824. M. Wylie’s contribution of 400 bushels of lime. As reported on page five, the total amount subscribed was $1,787.50.